Animal or Critter control isn’t an easy job. There are many different types of animals, all with different habits that need to be caught or exterminated. It’s always best to hire a professional to help you remove wild animals as they can be unpredictable and could attack and injure you. It is also illegal to attempt trapping and releasing many animals. Here are some common pests that critter control companies deal with every day and their common behaviors. In critter control and prevention one size does not fit all. Every home, every property and every neighborhood can be different. 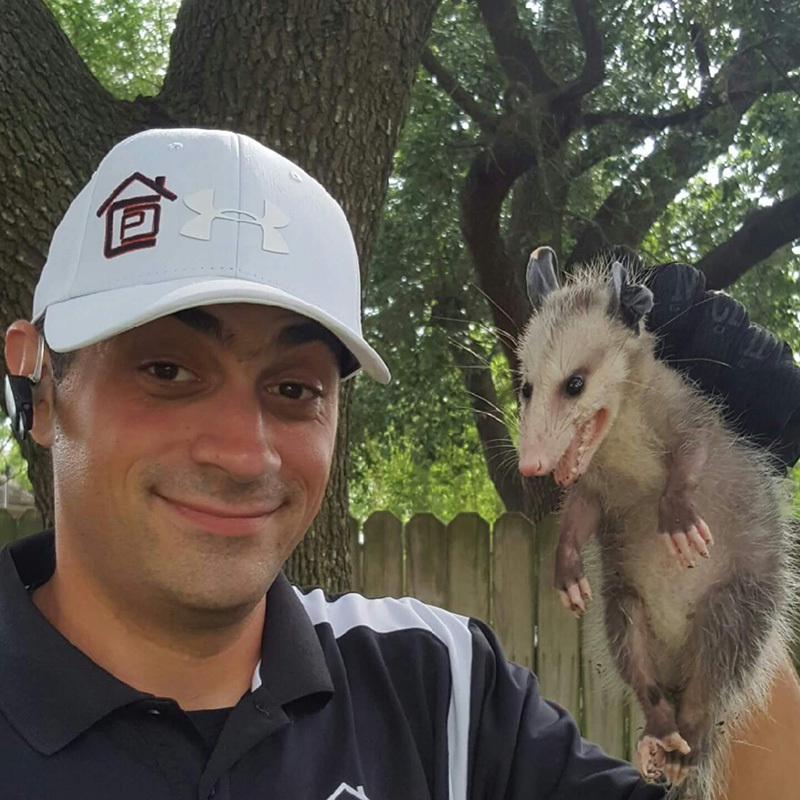 At Cypress Critter Control we inspect all three and make customized recommendations based on your needs. Outside perimeter treatments are the key to the elimination of inside pests. We treat from property line to property line to deliver the best results. Inside treatments can be frequent or infrequent depending on the circumstance and severity of the infestation. For every human, there are about one million ants. In tropical regions; where ants are very common, their weight can exceed that of ground-living mammals. Ever wonder how animals get into your home. We are one of the only companies that offer custom animal exclusion. We will audit your home and show you where animals are breaking into your home, and we will cover each and every way that they can get in. This includes working in the corners of your eaves, soffit vents, the corners of roof lines, weep holes and basically, every little crevice, crack, hole, broken soffit, broken screen patches, chimney access, and everywhere on your home the little creatures are busting in unwanted. We will provide a walk around of your home and show you the areas where you may have never guessed that the little guys and gals are getting in. We will then professionally close all these entrances into your home. 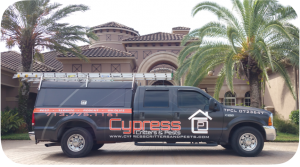 Cypress Critters and Pests Specializes in control, or catching the critters and animals that are treating your home like it is theirs. Our homes are our castles, and upkeep is a major part of owning a home. As the years go by, time, and the animals themselves find ways to break down barriers that block their way in. We have years of experience knowing how to find, and catch these little buggers when they do get in. It is amazing some of the places we have found them. Rest assured we will find the raccoon or opossum, mouse, rat, bat or whatever is cohabitating with you. 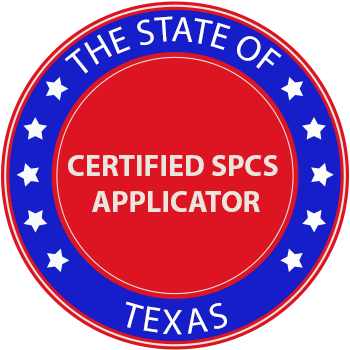 Call us today at: 713-775-1161. Opossums are marsupials that are native to the United States. They love suburban wooded areas east of the Tennessee in the US. Female opossums often have large litters of undeveloped joeys, most of whom fail to attach to a teat. The ones that attach themselves, usually survive. The babies can be the size of honey bees and are known as joeys in some areas of the country. They crawl inside the mother’s pouch and continue to grow and are typically weaned between 65 to 130 days. Once the babies are to large, they ride on the mother’s back while she hunts for food. 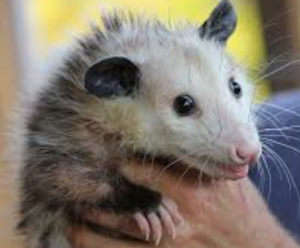 Typically opossums are small to medium-sized, nearly the size of a small cat or dog, They have narrow snouts, small eyes, and long, hairless prehensile tails, that act like a fifth limb, to help them climb trees. Their bodies are covered in grayish white fur, and they have more teeth than any other mammal in the United States. They have very sharp claws and opposable thumbs on their hind feet. Their long versatile tails make them good climbers so it is important to keep brushes and trees away from the roof line. They are nocturnal, and will eat most anything; garbage, roadkill, grass, birds, insects, eggs, snakes and even lizards. When they are threatened, they will play possum by imitating a dead or sick animal. They curl onto their backs, and their lips are drawn back with their teeth bared and sometimes excrete stinky liquid from their butts. Opossums will also make an effort to scare other predators by hissing and growling deeply, and baring their teeth. The babies have been known to make a sneezing sound to alert their mother to their distress if threatened. Opossums can be a nuisance when they take over attics, and sheds, or under backyard decks and even move into garages in residential homes. They make nests composed of cloth scraps, grass, twigs, and about anything they come across in dark, secluded areas where they feel safe sleeping during the daytime hours. At night, opossums they venture out into the night in backyards in search of food in garbage cans, gardens, and dog food left our for the dog. Opossums that do not fear living near humans might enter into homes during the night through any area they can find that is unsecured, including dog and cat door flaps. Opossums look like big grey rats, but they normally they do not attack people. They like to “play dead” when challenged so they can throw predators off guard and escape to live another day. The fact that they can carry bad diseases and sometimes have fleas, mites, and lice, which all create a danger to humans and domesticated pets. Opossums love fresh fruits and vegetables so they can be a danger to your garden. They will also eat pet food left outside overnight, and rummage through garbage cans or nearly anywhere to find bits and scraps of food to eat. Opossums are famous for entering chicken coops to destroy chickens, chicken nests, and the eggs they produce. Opossums are wild animals even though they are not prone to aggression towards humans. With this in mind, exclusion or removal attempts should be done by a trained professional. Opossums are normally solitary and nomadic. They stay in an area as long as the food and water are available. Many families will group together in any burrow they can find, or even under houses and back decks. 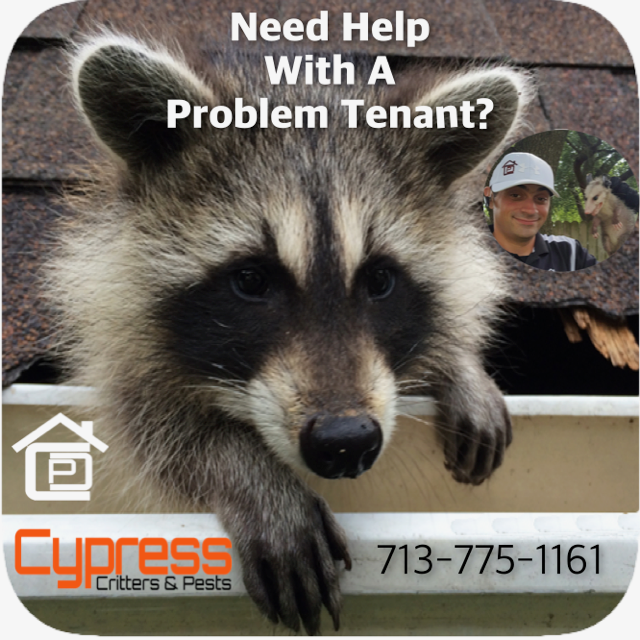 Cypress Critters and Pests specializes in Rodent and Critter exclusion and are educated in opossum behavior. They can trap and exclude infestations. Untrained people may not be aware , or have the resources, and certifications to safely and properly handle these wild animals as professionals do. Opossums are native to forests and wetlands throughout North America, and their omnivorous scavenging behavior allows them to fit in well among suburban environments. They prefer to nest in tree cavities or abandoned dens of other animals but sometimes take live in unoccupied attics, garages, sheds, or beneath porches. Opossums lead solitary lives, except when rearing joeys, and are almost exclusively nocturnal. Attics and garages should be sealed up tightly, to reduce the chance of opossums making their homes in your yards. This includes areas around the garage doors and windows, attic vents, and any even small gaps in walls or siding. Trimming overhanging tree branches and overgrown shrubbery can also help keep opossums from reaching attics and broken soffits. Let Cypress Critters and Pests take the worry out of your animal exclusion. We can get rid of that opossum problem. Although cute from a distance, raccoons are extremely dangerous, carry disease, and will attack humans and pets to protect themselves. They’re also extremely smart, opening jars, bags, and trashcan lids in order to sneak a snack. If you have children, it is important to warn them not to approach or disturb these creatures if spotted. They often nest and breed in dark, quiet places like attics or basements, and it may be a long time before you realize they have broken in. These services often target raccoons through use of bait and humane traps. They also seal off entrances to keep them out permanently. Once caught, the professionals will release uninjured raccoons back into designated wildlife areas. Although you may be able to shoo away unwanted raccoons from your garbage cans, it is important not to attempt trapping and removal yourself as it is dangerous and often illegal. Raccoons are protected fur-bearing animals. They have legal protections as game animals in most states. Live trapping and relocation may not be an option, since in some states it is illegal to transfer and release captive animals in areas other than the original capture site. Certified wildlife specialists and licensed trappers are required in order to dispose of, and remove problem raccoons, outside of specified seasons. Wild raccoons typically nest in tree cavities, rock crevices, underground burrows, and the abandoned dens of other animals, such as muskrat lodges. Yards containing easily accessible sources of food, such as outdoor pet food containers, vegetable gardens, unsecured trash bags, and compost heaps, often attract raccoons into residential areas. If a raccoon is fed or becomes comfortable living around humans, it may attempt bold moves such as entering homes through pet doors to raid kitchens for food. Chicken coops often face danger with raccoon presence, as hungry raccoons capable of opening fence latches, can find their way inside, and destroy nests, birds, and eggs. Raccoons are mammals that are common and nocturnal throughout the United States and North America, especially the wooded regions of the United States. These smart creatures have nimble hands and are intelligent problem solvers capable of opening latches, turning doorknobs, climbing, swimming, and running at speeds of over 10 miles per hour.Besides the native northern raccoon, there are six other existing species, most of which live on tropical islands. Raccoons like to live in woodland areas near water sources such as rivers, marshes, and streams. Much of their food supplies comes from aquatic invertebrates such as clams, crayfish, turtles, and snails. The masked creatures also eat a large variety of plant-based foods, such as acorns, fruits, vegetables, nuts, and corn. Urban areas, suburbs, and farms likewise make good homes for raccoons, who have adapted to city life by learning to scavenge from garbage cans, gardens, and crop fields. 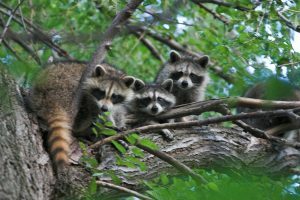 Wild raccoons typically nest in tree cavities, rock crevices, underground burrows, and the abandoned dens of other animals, such as muskrat lodges. In suburban areas, the animals have been known to seek the shelter of unoccupied buildings. Over 40 bat species exist in the United States alone, and nearly 1,000 different species live around the world. They have a bad reputation and are often thought of as flying rats. Bats are capable of spreading disease, much like rats, their existence is beneficial to humans and the environment in a way rats are not. While some bat species eat nectar, other small creatures, marine life, or, like the infamous vampire bats of South America, blood, the considerable preponderance of bat species are insectivores and maintain a regimen of night-flying insects like mosquitoes, insect, and moths. As these bugs are often pests themselves, regulated communities of bats around dwellings could be regarded as beneficial. Bats have shaggy frames that range in color to include tones of tan, red, brown, and grey. To compensate for their poor eyesight, bats typically have large ears designed for echolocation. At their smallest, bats mature between 2.5 to 3.5 inches (6 to 9 cm) in measure and feature a wingspan of about 8 inches (20 cm). More substantial species vary from 7 to 8 inches (18 to 20 cm) in size and have a wingspan roughly 21 and 23 inches (53 and 58 cm). Exceptionally multipurpose, bats set up roosting places in a wide array of natural environments like barrens, forests, residential areas, and central areas. Bats will use sheds, lofts, caverns, hardwood cavities, and the undersides of bridges to roost and/or overwinter. Generally, bats are harmless because they are night-loving and humans rest through their activity. In order to stay alive freezing winters in different locations of the globe, bats get into houses and roost in remote locations like attics. They can compress into entrances as small as a quarter of an inch (6 mm) in size, like fissures all around windows and doors, pipings and electric circuitry that lead within, and ventilation. 99 percent of rabies-related deaths are caused by rabid dogs, bats are still carriers of the ailment. Thankfully, even rabid bats avoid from nipping humans unless they really feel terrorized in some way. While the fungus that triggers histoplasmosis is not carried by bats, it resides in warmer, damp soil. Bat excrement function as a catalyst for the growth of the fungus, and human contagion takes place when people breathe in the spores. Bats also hold ectoparasites, like insects, flies, ticks, and mites, that jeopardize the physical health of humans and household pets. Bat pee can trigger a pervading and undesirable stink, while bat excrement tarnish ceilings and building visages. Since bat populaces can prove favorable, some property owners assemble what are called bat houses close to flower gardens and all around house in order to retain bats from roosting where they are undesirable. Since bats will likely still target any attainable facility, homes remain predisposed unless parties make the effort to quarantine possible points of access. As well as waterproofing gaps and gaps, enlightening attic room spots and eaves during bedtime hours helps hinder bats from roosting, as does putting fans in crawl spaces to bring down the temperature level. Capturing and removal of a bat can be challenging and should by no means be attempted if the bat was identified in a room where individuals were going to bed. While at your residence, Pest Management will determine the entry places bats are taking advantage of to gain access to your residence and establish tips to get rid of them entirely. All About Mice: Damages, Diseases They Cause And Why Hire Professional Exterminators! Hantavirus – Hantavirus pulmonary syndrome, or HV, is primarily carried by deer mice. It can cause flu-like symptoms, severe respiratory distress, and renal failure. It’s spread through feces, urine, and saliva. HV outbreaks have occurred before and have been responsible for dozens of states across the country. Lyme Disease – Lyme disease is found in all types of rodents, but most commonly in deer mice. Mice can bring infected ticks in with them, which can then spread the disease. Lyme disease can cause fever, headaches, skin lesions, and arthralgias. Plague – Even though the plague is often associated with rats, it can also be spread by mice. The plague can be transmitted from a mouse via a flea bite, but it can also be transmitted through contact with the mouse. The plague causes damage to the circulatory and respiratory systems. Salmonella – Salmonella is a type of food poisoning that causes intestinal disorders and can be spread by mice through feces contamination. Typhus – Typhus is spread through fleas, which mice can carry. Typhus can cause fever, rash, headaches, and respiratory attacks. Autumn is nearly upon us, and that indicates rats will probably be quickly scurrying in the outdoors into warmer places like your home. As soon as they get comfortable, they’ll quickly take over your home and build a colony within the cracks and cracks. If you want to put an end to this issue, you will need the help of rat exterminators Long Island can provide. Controlling a rodent outbreak is very important. History has shown that rats have already been a host animal to a lot of diseases and plagues. To begin with, they’re host to exterior parasites such as fleas and ticks that immediately cause diseases like typhus, leptospirosis, rat bite fever, rabies, and the recently found Hantavirus. Although this can be a hardly ever contracted disease, it may turn out to be lethal if not treated immediately. This virus is found in the stools of the deer mouse or white footed mouse. If you happen to run into this excrement, use caution when dealing with them. Rats also contribute significantly to the destruction of our indoor atmosphere with their pee and feces droppings. The droppings, in particular, certainly are a significant allergen source for children who’ve asthma. Also, they contaminate our food items with potentially harmful bacteria and germs. Once you discover remnants of rodents in your home, call a Long Island pest control service right away. The harm that rodents bring to a physical house is significant. Aside from being disease providers, rats could make living difficult for you personally when it comes to the stuff you’ve got lying around your home. The front teeth of a rat continue to develop throughout its life span, that is why it needs to continuously gnaw on objects. It must do this habitually for them not to develop also long. Because of this behavior, you’ll find that electrical lines, burglar alarms, and the base of doorways and entranceways will indicate signs of harm brought on by rats. They will also search out comfortable materials for nesting, that is why items saved in basements, sheds, and garages will always show tell-tale bite marks. These products consist of patio furniture cushions, pool covers, saved clothes, and bedding. Unlike roach control, which can be accomplished by spraying some chemical agents around the home, rat control requires an entirely different approach. Rats are intelligent animals that can sense many types of danger and avoid it to stay alive. Handling a rat control problem can be a challenging pursuit if you do not know some successful methods of rat control. The first step in successful rat control is to find out where the rats are living or where they can come into your home. Rats like quiet, dark areas to build their nests, so you will be looking for a ball of fuzz and rat droppings in a dark area to determine where the rats are living. There may even be a trail of rat dropping leading from the area where they are stealing food back to where their nesting area is. High pitch sound devices – electronic devices that produce a high pitch sound that is not hearable to people or pets, but irritating for rodents. Those gadgets drive rats away from your property, without damaging them. They just produce a unique sound which makes it intolerable for rats to stay in the area where the device is installed, driving them away to a place more appropriate for their nesting. Those devices are very well-designed, and it spares you the troubles with disposing of the rat’s dead bodies, which with rat traps or rat poison is almost inevitable. Rat zapper – electricity powered rat trap that kills the rat instantly, with a powerful electric charge, living the dead rodent in a particular container for little rat corpses. Rats can carry and transmit dangerous illnesses, which you and your family or pets most definitely want to avoid. The rat container gives an excellent opportunity to prevent direct contact with the dead animal, and remove it safely into a garbage container. Rat traps – a classic method that gives rats no chance for escaping, crushing them into pieces before they know it. Most traditional yet mighty way to capture rats, mice or other rodents. Although it has its down sides, it is the cheapest method out there, at least if going for a wooden rat trap. You have to set up many traps all over the infested area, to make sure that all the rodent are exterminated, but when the work is done, be ready for some messy cleansing, and pray you have a strong stomach. Direct contact is another thing you will have to deal with, after using rat traps. Besides, traditional rat traps might be dangerous for your pets or children. Rat repellent – a deadly rat poison that you apply around infested areas, which kills the rodent if it comes in contact with the substance. Rat repellent does its job, but it may be unsafe to your domestic animals. So you might think twice before actually using it. Also, conceder all those dead rat corpses, lying around your cellar and the cleaning up you will have to perform. Also, the biggest problem with rat poison is that rats won’t die instantly, and instead it will run off to a safer, unreachable place and die there. The smell will become intolerable in some time, and you will need the help of professionals with specialized equipment to help your problem. Probably the least welcomed pest ever to enter a home or yard, the skunk releases a strong, foul smell when frightened, stressed, or threatened. Household pets, particularly dogs, are susceptible to being sprayed, and removing the odor is quite unpleasant and time-consuming. The odor from skunk spray can last a long time and even if outdoors will be noticeable in your home. Like most other mammals of its size, they can also bite and scratch if cornered. 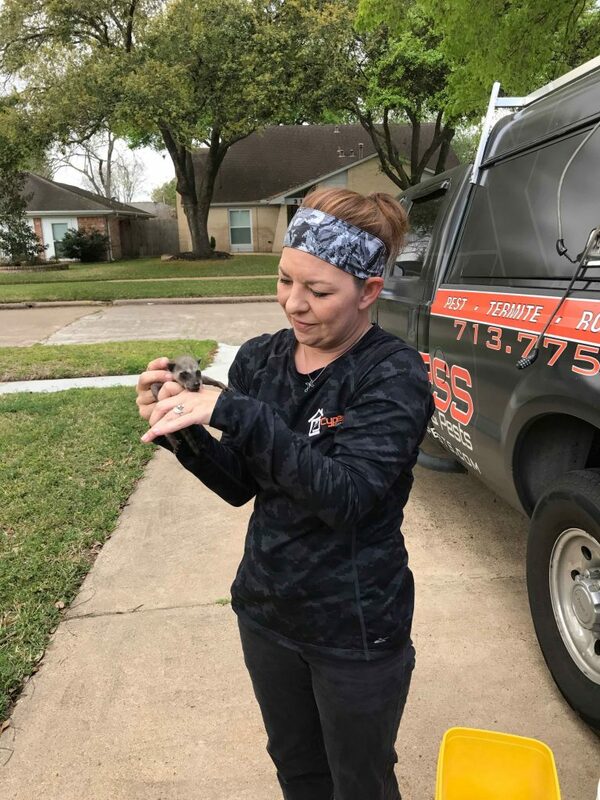 Critter control professionals handle skunks in the same way they do raccoons: catch and release. Skunks tend to stay outdoors and rarely wander into homes, but more often live under homes, decks, or in gardens. Although they live outdoors and are generally non-threatening as they are shy and would rather run than fight, moles and groundhogs, however, destroy gardens. They dig tunnels, ruining flowerbeds and grass. Some of these companies will attempt catching and releasing these creatures, but others may use poison. If humane treatment of pests is important to you, research critter control services beforehand in order to find one with an animal-friendly policy. Moles and groundhogs are a bit trickier than other pests to capture, so you may want to look for a specialist. Cypress Critters and Pests can provide you with tips to help keep your home pest-free. Check outdoor entrances such as grates and vents to ensure they are tightly sealed. Fix broken windows and cracks quickly before animals use them as gateways. Keep garbage cans closed tightly and weighted at the top if necessary. Pet food should also be stored carefully as the scent can attract hungry animals. Since so many of these pests can bring in diseases and post real health risks to you and your family, it is important to have them removed. It pays to shop around, but it also pays to find the right company that will do the job you need to be done within the budget you have set. Since the health of your home and your family is so important, it is equally as important to find the right critter control and removal people to help keep your home clean and free from pests. Have a friend hanging around in your attic?